Oh dear, where did it all go wrong. Noah, the new biblical epic based on the Old Testament story of the man God chose to rescue mankind and the animal kingdom from the flood which he sent to cleanse the earth, had such potential. However the result, directed by blockbuster king Darren Aronofsky – featuring Russell Crowe, Jennifer Connelly, Anthony Hopkins, Ray Winstone and Emma Watson – is a monumental washout of prehistoric proportions. This is the bible story of Noah (Crowe) who, after visions from God, built an ark big enough to house two of every species of living creature. Then, with his wife Naameh (Connelly) sons Shem (Douglas Booth), Ham (Logan Lerman) and Japheth (Leo McHugh Carroll) and ‘daughter-in-law’ Ila (Watson), he went inside, shut the door and waited for God’s flood. Except it’s not the story at all. If you were expecting an old style Hollywood interpretation of one of the Bible’s best known tales akin to a Cecil B. DeMille epic, you’ll be sorely disappointed. Instead we have a modern reworking with little resemblance to the original story, obviously fashioned to appeal to the wider secular population. You could go into the inaccuracies from a Biblical standpoint, but frankly it’s so riddled with them that it’d be hard to know where to start. Suffice to say when the stone giants are introduced – apparently they are the fallen angels cast from Heaven by God at the creation of the world – and start helping Noah and his family build the ark, you know you’re onto a looser. Facts (or fiction) aside, even the aspects of the production which could have saved it – the gathering of the animals two by two into the ark, and the flood itself once it eventually hits – are glossed over so quickly and depicted in such a diluted form, that they loose any of their potential wonder or shock value. Here, if the bible is to be believed, was a boat which would have housed thousands of species of living creatures. Instead we are treated to an all encompassing overshot of hordes of animals of which it is difficult to decipher the different types; the only thing which is really focused on are a legion of snakes included one feels more for their unpleasantness than any historical accuracy. As for the torrential rains which swamped humanity – these have appeared and swept away anyone not within the safety of the ark almost before you realise what is happening. One has always imagined those left behind would have been clambering over Noah’s stronghold in an effort to find safety, or scaling the highest mountain or tree for potential refuge. Here – other than a brief glimpse of a hilltop covered with a writhing mass of bedraggled humanity – most of mankind is obliterated by one giant tidal wave which has come and gone before you can say tsunami. Neither does the film’s ‘A’ list laden cast do much to keep the sodden production afloat. It is probably reasonably accurate to say that the people who populated the earth during the time of Noah were a pretty rough and ready bunch by modern standards. Even so one can’t imagine that they were as disagreeable a group of characters as depicted here. 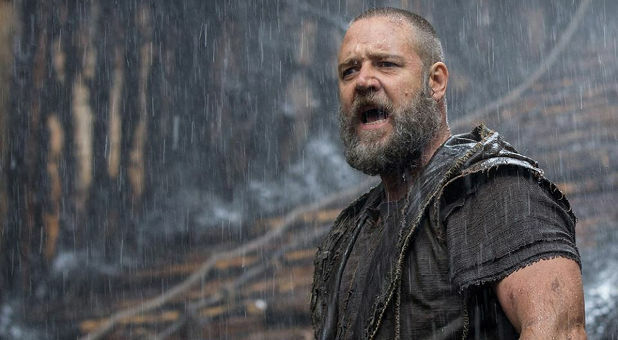 Crowe’s Noah is a dark and broody man who suspects everyone (including most of his family) of potential unpleasantness. And what about the said family (and most of the other characters who pepper the proceedings)? Well, on the whole they are somewhat ineffectual – no better, but certainly no worse, than Noah himself. One of the overriding questions this film provokes is to whom it’s really aimed. Christian audiences (if they go to see it at all) will find objection with the liberties it takes with its twisting and modification of biblical truths. On the opposite side non-Christians will likely find little appeal in a film based on what many people now see as mere folklore and fairytales. The result is a film which will be pushed to establish a core audience, and as a result be unlikely to last as long in the memory as the story on which it is based.